The day was June 24, 1876 — the same year the nation celebrated its centennial anniversary. Ulysses S. Grant was President and, on the same afternoon, General George Armstrong Custer was massing his troops to attack Sitting Bull and the Sioux nation near a small Montana stream called the Little Big Horn. On this Saturday afternoon, Forest Park was officially opened to the public and dedicated at a large public ceremony. June 24, 1876: Forest Park officially opens to an estimated 50,000-strong crowd. Consisting of 1,371 acres of St. Louis countryside, Forest Park exceeds New York's Central Park by more than 500 acres. The 1876 plan of Forest Park. Because of shortages of time and money, the commissioners were unable to supply some of the planned features, such as the Cascades, pictured upper left. During this time, urban areas suffering from the residual effects of the industrial revolution, created environmental issues ranging from heavy smog to acid rain. St. Louis was one of the most adversely affected cities; and many health professionals praised the clean air of the less developed countryside (which the Park was then considered) as beneficial to city-dwellers. Founders of Forest Park negotiated public transportation to the area in the form of a train from downtown, bringing thousands of visitors to the Park each day. In addition, in the first years of the Park’s existence, 19 miles of gravel roads were laid at a cost of $16,000 per mile. 1885: As the city spread further west and encroached upon the eastern border of the Park, streetcar lines were extended to Forest Park, and hundreds of thousands of people began visiting each year. Prior to the arrival of streetcars in summer of 1885, the only public transportation remained by train. This limited the numbers of people who used the Park primarily to those on horseback or in vehicles of some kind. Even for people who rode in carriages or on horseback, the trip was dusty and hot in the summer months, muddy and buggy in fall and spring. Under new management and a stretched budget after becoming an entity of the newly separated St. Louis City, Forest Park officials struggle to continue developing recreational areas and support structures. Areas that prospered, however included the nursery, which was established to provide plants and landscaping, and the Missouri Fish Commission’s fish-rearing operations, whose carp-spawning operations grew so large that the fish were used to populate lakes throughout the state. 1894: The Post-Dispatch undertakes fundraising efforts to extend the Park’s main lake (explaining the name Post-Dispatch Lake). Donations exceeded $19,000 at a time when $1.00 would buy 50 pounds of flour and a man’s suit cost about $7.50. 1896: The seven streetcar lines serving Forest Park carry more than 2.5 million Park-goers a year. Two pavilions abutting streetcar lines, the Lindell Pavilion and the Laclede Pavilion, were built in the early ’90s to accommodate the crowds. The Laclede Pavilion was torn down in 1938; the Lindell Pavilion partially burned down in 1924 and has been restored in a variety of capacities, finally as a visitor and education center for Forest Park. 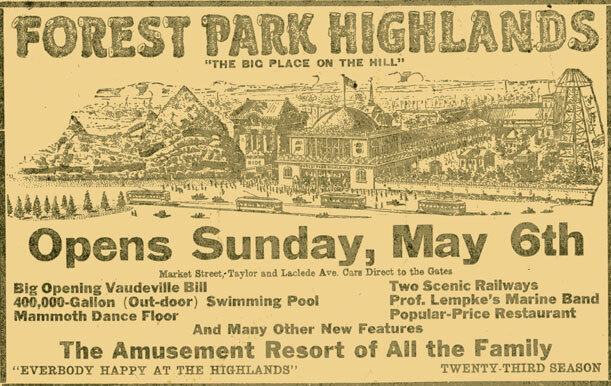 1896: The Forest Park Highlands Amusement Park opens. 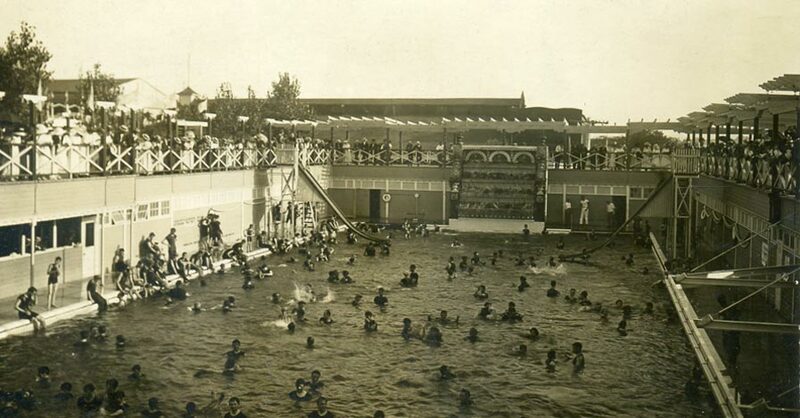 Once St. Louis' largest and best-known amusement park, the Highlands boasts a fine theater and one of the largest public swimming pools in the United States. 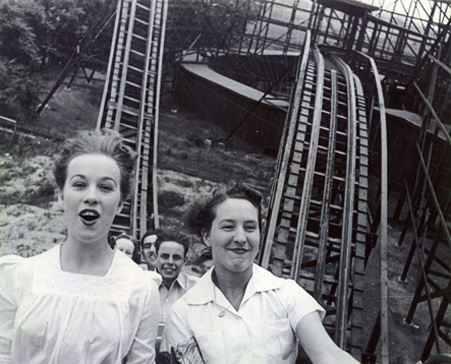 A special thank you to Doug Garner for more Highlands Amusement Park information and photos. Visit his website for much more. Developers’ visions of a fashionable neighborhood surrounding Forest Park came to fruition as private streets took hold north and east of the Park in what came to be known as the Central West End. 1900: St. Louis developers and politicians successfully lobby for the city to host the 1904 World’s Fair. Despite initial suggestions that the Fairgrounds be placed downtown, officials eventually secure the Park as the official grounds. 1904: The Fair is a tremendous success! More than 20 million attendees visited the Fair between April 30 and December 1, 1904 — upwards of 100,000 people per day. However, the wear and tear on Forest Park is noticeable and the next seven years are spent putting the Park back together. Washington University, which was constructing its main administration buildings at the time, agreed to delay moving into the buildings until after the Fair. The University loaned what is now known as Brookings Hall to the Fair for its administrative headquarters. The School and Museum of Fine Arts, also a branch of Washington University, was completing its plan to build a museum in the Park when it was determined that the Fair would have to have a permanent, fire-proof structure for its Palace of Fine Arts. The groups got together and determined that the building, constructed upon the Park’s highest hill, would be handed over to the School and Museum after the Fair. The Museum (now the Saint Louis Art Museum) is the only Fair structure in this area that remains standing today; all other exhibition palaces were temporary, built of plaster and wood. In all, more than 900 structures were built to house exhibits from 22 countries and 44 U.S. cities, concession stands, concerts and more. The city also hosted the 1904 Olympics, the third of the modern era, and the first-ever in the U.S.
1911: Dwight F. Davis became Parks commissioner. Davis was an enthusiastic proponent of recreational and athletic activities. 1912: The first official public golf course in St. Louis opened in the Park. It was soon expanded to 18 holes and another nine-hole course was added. Davis also built 32 public tennis courts. 1917: A coalition raised the funds and interest to build the Municipal Theatre, or the Muny, as it came to be known. The 10,000-seat theatre’s first productions were "Aida" and "I Pagliacci." 1918: The City of St. Louis set aside land on the South side of the Park for a landing field for airmail service, also erecting a hangar that currently serves as the headquarters for the Mounted Police. The airfield was used as a mail delivery stop for less than a year, after which private pilots used the facility for exhibition flights. 1919: The MUNY's summer season is offically initated. From the very beginning, free seats were offered within the theatre and above the seats on the grass. The Saint Louis Zoo saw significant enhancements during the 20s. The natural looking bear pits, constructed of concrete and using cast molds of limestone bluffs above the Mississippi near Herculaneum, were added in the early 20s. They received national recognition for their natural appearance. The Zoo’s Primate House opened in 1925; the Reptile House in 1927. 1923: After the River des Peres was deemed a "inexcusable nuisance" by the Missouri Supreme Court. St. Louis residents pass a bond issue, permanently sending it underground forever. A man-made river was later installed in the Park as part of the Forest Park Master Plan. 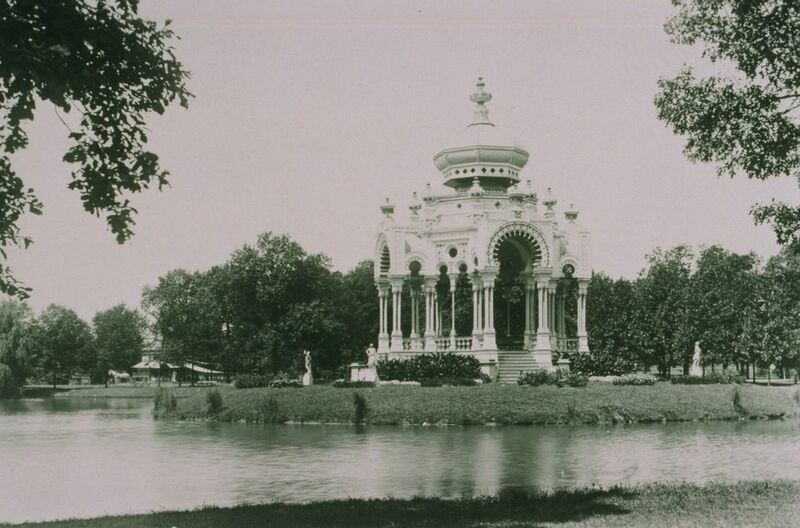 1925: After a storm and fire damaged the original bandstand, U.S. Rep. Nathan Frank stepped up with the money to rebuild the centerpiece of Pagoda Circle. With his gift, he encouraged others to support the Park and described the reasons for his own support this way: "All that I have, all that I have acquired, I owe to St. Louis." Today, the Forest Park Forever Nathan Frank Society is named in his honor. June 19, 1927: 100,000+ people jammed Art Hill to welcome Charles A. Lindbergh back to St. Louis after his nonstop flight from New York to Paris. Though Lindbergh had lived in St. Louis only two years, he made the city world famous by naming his plane the Spirit of St. Louis at the request of a group of businessmen who had funded his aviation efforts. 1929: Before the highway was constructed, cutting it off from the Park, the St. Louis Arena opened adjacent to the Forest Park Highlands Amusement Park. With floor room for seating for 21,000, it was the largest building of its kind in the world, and boasted more floor space than Madison Square Garden. Both Seven Pools (located near the Park's southeastern corner) and the Cascades (located across the street from the lower golf course) were added to Forest Park. November 14, 1936: The Jewel Box is opened and dedicated. It later achieves national recognition for its design. The project cost more than $100,000 and was paid in part with from the Public Works Administration program. 1930: Electric boats were introduced in the Grand Basin and were so popular that people sometimes waited until after midnight to rent one. During World War II, Forest Park housed a recreation camp for men on weekend leave; the camp could accommodate up to 1,500 white servicemen. The Army Recreation Camp for Negroes, however, was more than a mile away at Spring and Chouteau. After the war, blacks and whites worked together to end segregation in uses of the Park’s facilities, including the tennis courts and golf courses. 1948: Seating at the Muny is desegregated and was peacefully opened to all. 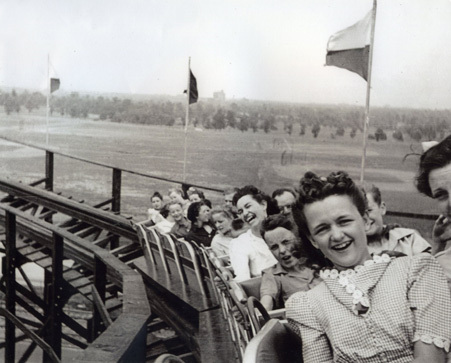 It was during the 1940s that the Muny altered its selection of popular shows, versus traditional opera, and attracted national attention, at the same time that outdoor theatres across the country were closing down. It was also during this decade that the Muny received significant architectural improvements, including the circular box office that still operates today. 1955: Forest Park received its largest single donation in its first hundred years, for construction of the Mark C Steinberg Memorial Skating Rink. The private donor made the gift with the stipulation that the rink be open to all people, making it one of the few desegregated venues in St. Louis at the time. 1957: Steinberg Memorial Skating Rink opens to the public with state-of-the-art facilities that could be used throughout winter, regardless of weather conditions. It was during the 1960s that the Saint Louis Zoo finally separated itself from the land surrounding it, and built entrances and the serpentine wall to differentiate the Zoo’s land from the rest of the Park. 1963: The Saint Louis Zoo Train began operating, providing an enjoyable ride, a rest for the feet, and additional revenue for the zoo. The Planetarium opened to the East of the Zoo. Like all other Park attractions, the Planetarium was open and free to the public, and charged a nominal fee only to view the Star Show. 1968: Tens of thousands of white and black St. Louisans attended a memorial service in the Park after the assassination of Dr. Martin Luther King. The service concluded a march that began at the riverfront Arch. City organizers planned free bus service back downtown and throughout the city from the Park to prevent any skirmishes, and many attribute the planning to the lack of violence that was witnessed in other cities. 1971: The Metropolitan Zoological Park and Museum District is created to establish a property tax to support the Saint Louis Zoo, Saint Louis Art Museum and the Museum of Science and Natural History, later known as the Saint Louis Science Center. Voters said 'yes' to this tax, and the ZMD, as it's known, began operations in 1972. Today, tax revenue also supports the Missouri History Museum and the Missouri Botanical Garden. 1976: Big Cat Country opened at the Saint Louis Zoo and won the American Association of Zoological Parks and Aquariums prize for the best new exhibit. That same year the Saint Louis Art Museum began renovation of the east wing and announced plans for a new wing surrounding the earlier auditorium addition. The renovated wing opened in 1977. It becomes apparent to the St. Louis community, including City officials and neighborhood groups, that Forest Park is inadequately funded, with years of deferred maintenance taking their toll, threatening to let this storied destination slip into permanent neglect and disrepair. Increased funds would be required to repair and improve the historic structures, recreational facilities and complex ecological systems within the Park. It was critical that Forest Park remain beautiful and accessible. 1986: Forest Park Forever, a private, nonprofit organization, was founded in 1986 to work in partnership with the City of St. Louis Department of Parks, Recreation and Forestry to make Forest Park the finest urban park in the nation. Initial efforts by Forest Park Forever raised money to make improvements upon existing facilities within the Park. Over the next several years, money was raised by Forest Park Forever for specific projects, including repairs to the Victorian Bridge, renovation of the Nathan Frank Bandstand and re-lighting and renovation of the statues in the Park. Private funds were used to landscape and re-grade the Rugby Field, install 30 new park benches, provide family picnic pavilions, plant hundreds of new trees and provide for emergency maintenance needs. 1995: The City of St. Louis adopted the Forest Park Master Plan to integrate the Park’s natural and man-made systems into a cohesive and mutually beneficial ecosystem. The goal of the Master Plan is "to create a total park experience" that stimulates the mind, body and spirit through a variety of natural, cultural, educational and recreational facilities, opportunities and amenities. Most importantly, the plan was realistic and attainable. 1996: Forest Park Forever and the City of St. Louis launch the Restoring the Glory campaign to raise $94 million for Park renovations. 2003: After years of decline, the Jewel Box re-opened to the public and introduced new features to allow the facility to host special events. 2003: The dramatically restored Emerson Grand Basin becomes a St. Louis landmark, providing a backdrop for countless graduation, prom and wedding photos each year. June 2003: Private gifts fund new construction on the Boathouse, adding a restaurant, an event space and another unique feature to Forest Park. 2004: The Forest Park Connected Waterway System, Emerson Grand Basin and Post-Dispatch Lake are recognized by the American Society for Civil Engineers for Outstanding Civic Engineering Achievement. 2005: The Jewel Box Conservatory earns a Merit Award for Landscape Architecture and Design from the American Society of Landscape Architecture. 2011: The Forest Park Trolleys emerges in the Park carrying 88,000 riders its inaugural season and a total of 372,000 riders to date! 2013: Forest Park is named a "Great Public Space" by the American Planning Association.